When replacing the oil pan gasket, I also cleaned the oil pickup screen and checked to be sure the bolts holding the pickup are tightened to the proper torque, 72 INCH/Pounds, not FOOT/Pounds. I used an INCH/Pound torque wrench on them and also on the oil pan bolts which were set to 70 INCH/Pounds in several stages. These bolts are easy to strip out unless you use an INCH/Pound torque wrench. I put in new points and a condenser when I replaced the cam shaft seal and replaced the timing plate machine screws with two Allan head cap screws, M4x0.7×10. Now its easy to adjust the timing plate points cam with the centrifugal advance weights installed with a small Allan head wrench. And, I won’t be wallowing out the slot on machine screws as happened in the past. I used my larger adjustable seal puller to remove the camshaft seal, but it makes me nervous since the camshaft seal is small and I don’t want to score the camshaft. After I got the camshaft seal pulled, I looked for a puller for small seals. 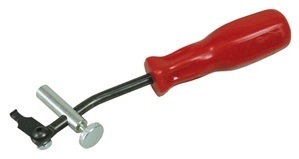 I found a very promising one, Lisle 58430 shaft seal puller. It’s available at some auto parts stores, but I ordered mine from Amazon. I think this will work very well on future seal pulling jobs. Here are a few pictures of the work. This entry was posted in 1973 BMW R75/5 Rebuild Blogs, MC Build Projects and tagged 1973 BMW R75/5 Rebuild Blogs, BMW R75/5 Cam Shaft Seal, BMW R75/5 Oil Pan Gasket, BMW R75/5 Rebuild by breams. Bookmark the permalink. Many thanks for the great article, I was hunting for specifics such as this, visiting look at the other blog posts. Thanks for dropping by, and your welcome.